These connections are made by etching a stair-step pattern into the layers and sinking vias down to connect with each level. 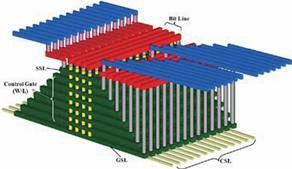 This is illustrated in this post’s first graphic showing Samsung’s TCAT 3D NAND. In the top left side we see stairsteps that are improperly connected to their vias. In the top circled connection the via only halfway connects to the step since steps were etched with an uneven widths. This is explained by the top middle photo. If steps are uneven, then the vias’ connections to the wordlines will have inconsistent resistance, leading to unreliable performance. The photo at the right shows a tapered edge on a step, which leads to the problem depicted in the lower red circle on the top-left drawing. Here the via may or may not actually connect to the wordline, leading to the prospective failure of an entire flash block. The lower three frames of this graphic show the ideal: Steps are evenly etched and profiles are straight, leading to reliable connections. One fortunate thing about the etch process is that layers can be specifically etched. 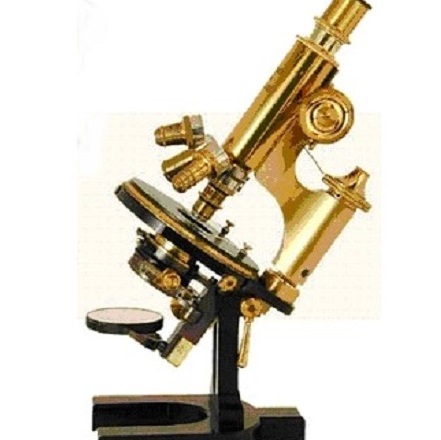 Through various means, like etch chemistry and the color of the radiated light, the etcher can tell whether it is etching one material or the other, and can be stopped as soon as it reaches a new material. 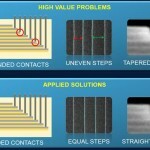 In the BiCS case a stairstep must stop etching when it reaches the polysilicon wordline plane; for TCAT etching would be stopped once it reaches a tantalum nitride plane. Either way, the process can be stopped at each layer very precisely. 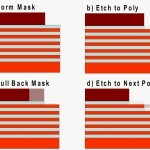 First the mask is photographically patterned and etched to create a hole the width of a single step (Step a in the graphic), and the first poly layer is etched (Step b). I have used a faded color to show what was just etched away. In Step c, the hard mask is etched sideways (which I have been told is very controllable) the width of a single step. This is called a “pull-back” and has been put into production for other processes, so it is a well-understood approach. Again layers are etched to the start of a new polysilicon layer (Step d), but the part that has already been etched goes down another layer, while the newly-exposed portion etches down to the first poly layer. This process is repeated according to the number of layers there are. In the case of Samsung’s 2013 V-NAND, with its 24 layers, this step would ideally be repeated 23 times. Existing production-volume semiconductor processes use a pull-back no more than once. Controlling 23 pull-backs can be problematic if it is not well controlled, since errors can accumulate. Today manufacturers will perform this process only 6-12 times before using a second photolithography step to create a new mask. 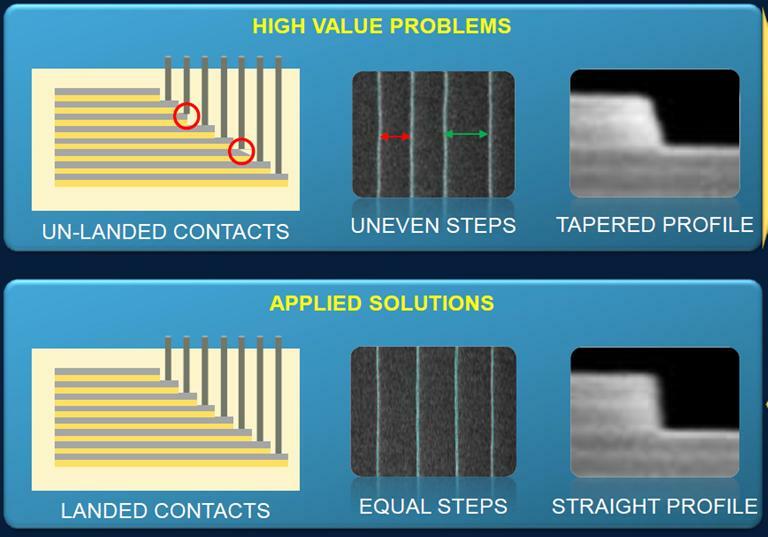 As confidence grows, the number of pull-backs per lithography step will increase, with the ultimate goal of forming all of the stairsteps using only one lithography cycle. Finally, a very thick silicon dioxide layer is deposited on top of the entire staircase, another pattern is lithographically created for the vias, and trenches are etched down to the polysilicon layer. The etch is controlled to remove only the silicon dioxide, so each trench stops when the polysilicon is reached. The vias are then filled with conductive material (tungsten or polysilicon) to bring the control gate connections or wordlines to the top of the chip where it can be routed to other vias that connect them back down to the CMOS logic on the substrate that drives the array. The stairstep etch is yet another very difficult and new process that must be managed to successfully mass produce 3D NAND. The vias must land precisely on their designated stairstep and not on any others, or the wordlines will be shorted to each other. If the via doesn’t make a solid connection with a poly layer its resistance may prevent that entire wordline from working properly. 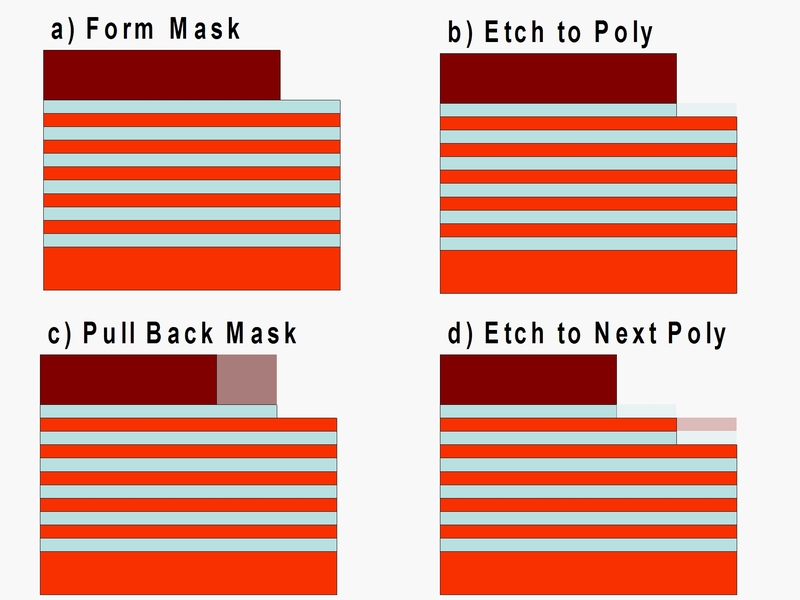 This means that the mask pull-back must align precisely with the litho pattern of the connecting vias. You can imagine what a challenge this is! What is striking is that the process of getting to the wordlines rivals the complexity of making the vertical bit strings themselves. 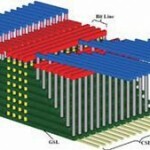 Clearly 3D NAND involves a broad range of challenges, and it will take a significant effort to move from a planar process to 3D. Coventor has shared a video of the process of making 3D NAND that details the stairstep process. This animation can be accessed from another post on The Memory Guy. Have a look and you will be amazed at its complexity! 6 Responses to 3D NAND: How do You Access the Control Gates?